NORTH CANTON, Ohio, March 18, 2019 /PRNewswire/ -- The Timken Company (NYSE: TKR), a world leader in engineered bearings and power transmission products, is celebrating safety in South Carolina. 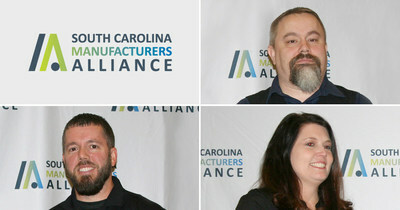 The South Carolina Manufacturers Association last week honored Timken’s Gaffney and Honea Path plants as 2018 Plant Safety Award winners at its annual Safety Summit in Spartanburg, S.C.
Timken is committed to achieving a safe and accident-free workplace, with initiatives that are championed by executive leadership, coordinated and shared globally and emphasized through a culture of accountability. Last year, Timken’s lost-time-accident rate was the second-lowest in company history. Timken’s Gaffney bearing plant produces high-volume and medium-volume tapered roller bearings up to 6 inches. Timken’s Honea Path plant produces medium-and low-volume tapered roller bearings up to 8 inches, matched-bearing assemblies, and engineered surface coatings.